52 D I V E R S I T Y W O M A N Fa l l 2 0 1 7 d i v e r s i t y w o m a n . c o m e Mt Powerl Women inCorporateAmerica * Information not found on company website; Bloomberg used instead. ** Information not found on company website; Wall Street Journal used instead. Lonni L. Dieck, Senior Vice Presi- dent and Treasurer 168. Icahn Enterpr 169. Nucor 170. NtEra Energy Deborah H. Caplan, Executive Vice President, Human Resources and Corporate Services 171. Performance Food Group Carol O'Connell, Senior Vice Presi- dent and Chief Human Resources Officer 172. 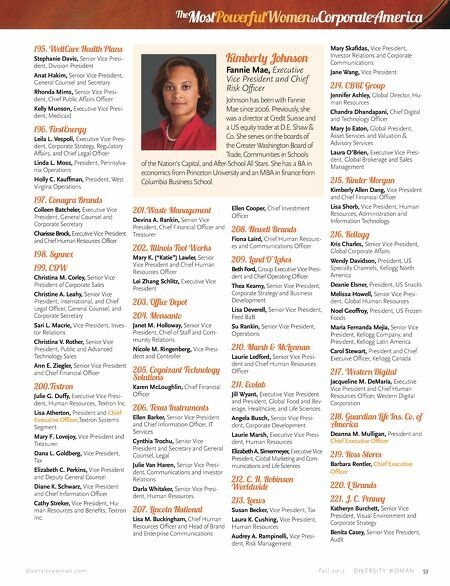 PBF Energy Trecia Canty, Senior Vice President, General Counsel and Secretary 173. Halliburton Lyn Beaty, Senior Vice President, Finance 174. CarMax Diane Cafritz, Senior Vice President and Chief Human Resources Officer Laura Donahue, Vice President, Advertising Katharine Kenny, Vice President, Investor Relations Sarah Lane, Vice President, Market- ing Strategy Jill Livesay, Vice President and Controller Lynn Mussatt, Vice President, Business Operations and Customer Service Julie Reed, Vice President, Procure- ment and Strategic Sourcing 175. 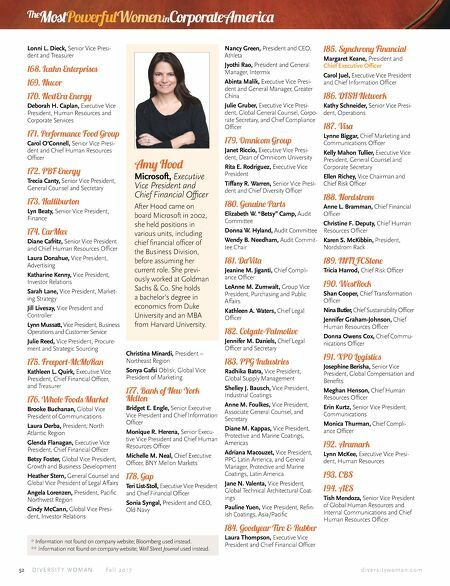 Freeport-McMoRan Kathleen L. Quirk, Executive Vice President, Chief Financial Officer, and Treasurer 176. Whole Foods Market Brooke Buchanan, Global Vice President of Communications Laura Derba, President, North Atlantic Region Glenda Flanagan, Executive Vice President, Chief Financial Officer Betsy Foster, Global Vice President, Growth and Business Development Heather Stern, General Counsel and Global Vice President of Legal Affairs Angela Lorenzen, President, Pacific Northwest Region Cindy McCann, Global Vice Presi- dent, Investor Relations Christina Minardi, President – Northeast Region Sonya Gafsi Oblisk, Global Vice President of Marketing 177. Bank of New York Mellon Bridget E. Engle, Senior Executive Vice President and Chief Information Officer Monique R. Herena, Senior Execu- tive Vice President and Chief Human Resources Officer Michelle M. Neal, Chief Executive Officer, BNY Mellon Markets 178. Gap Teri List-Stoll, Executive Vice President and Chief Financial Officer Sonia Syngal, President and CEO, Old Navy Nancy Green, President and CEO, Athleta Jyothi Rao, President and General Manager, Intermix Abinta Malik, Executive Vice Presi- dent and General Manager, Greater China Julie Gruber, Executive Vice Presi- dent, Global General Counsel, Corpo- rate Secretary, and Chief Compliance Officer 179. Omnicom Group Janet Riccio, Executive Vice Presi- dent, Dean of Omnicom University Rita E. Rodriguez, Executive Vice President Tiffany R. Warren, Senior Vice Presi- dent and Chief Diversity Officer 180. Genuine Parts Elizabeth W. "Betsy" Camp, Audit Committee Donna W. Hyland, Audit Committee Wendy B. Needham, Audit Commit- tee Chair 181. DaVita Jeanine M. Jiganti, Chief Compli- ance Officer LeAnne M. Zumwalt, Group Vice President, Purchasing and Public Affairs Kathleen A. Waters, Chief Legal Officer 182. Colgate-Palmolive Jennifer M. Daniels, Chief Legal Officer and Secretary 183. PPG Industri Radhika Batra, Vice President, Global Supply Management Shelley J. Bausch, Vice President, Industrial Coatings Anne M. Foulkes, Vice President, Associate General Counsel, and Secretary Diane M. Kappas, Vice President, Protective and Marine Coatings, Americas Adriana Macouzet, Vice President, PPG Latin America, and General Manager, Protective and Marine Coatings, Latin America Jane N. Valenta, Vice President, Global Technical Architectural Coat- ings Pauline Yuen, Vice President, Refin- ish Coatings, Asia/Pacific 184. Goodyear re & Rubber Laura Thompson, Executive Vice President and Chief Financial Officer 185. Synchrony Financial Margaret Keane, President and Chief Executive Officer Carol Juel, Executive Vice President and Chief Information Officer 186. DISH Network Kathy Schneider, Senior Vice Presi- dent, Operations 187. Va Lynne Biggar, Chief Marketing and Communications Officer Kelly Mahon Tullier, Executive Vice President, General Counsel and Corporate Secretary Ellen Richey, Vice Chairman and Chief Risk Officer 188. Nordstrom Anne L. Bramman, Chief Financial Officer Christine F. Deputy, Chief Human Resources Officer Karen S. McKibbin, President, Nordstrom Rack 189. INTL FCStone Tricia Harrod, Chief Risk Officer 190. WtRock Shan Cooper, Chief Transformation Officer Nina Butler, Chief Sustainability Officer Jennifer Graham-Johnson, Chief Human Resources Officer Donna Owens Cox, Chief Commu- nications Officer 191. XPO Logtics Josephine Berisha, Senior Vice President, Global Compensation and Benefits Meghan Henson, Chief Human Resources Officer Erin Kurtz, Senior Vice President, Communications Monica Thurman, Chief Compli- ance Officer 192. Aramark Lynn McKee, Executive Vice Presi- dent, Human Resources 193. CBS 194. AES Tish Mendoza, Senior Vice President of Global Human Resources and Internal Communications and Chief Human Resources Officer Amy Hood Microsoft, Executive Vice President and Chief Financial Officer After Hood came on board Microsoft in 2002, she held positions in various units, including chief financial officer of the Business Division, before assuming her current role. She previ- ously worked at Goldman Sachs & Co. She holds a bachelor's degree in economics from Duke University and an MBA from Harvard University.